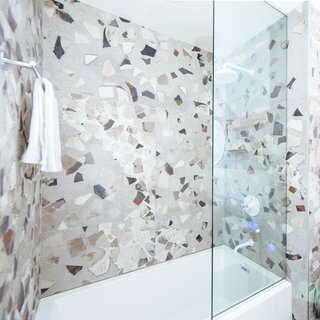 A client’s childhood love of terrazzo and minimalist living inspires a contemporary transformation of a dated master bath. 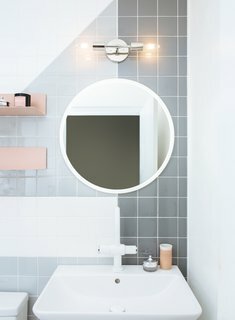 Charmed by the Instagram feed of Design Bar Detroit, a client reached out to the interior design studio with a vision for a bathroom renovation she coined "’60s Italian Dystopia." 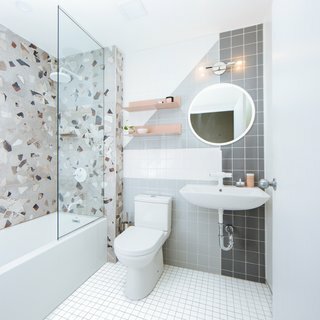 A well-traveled individual unafraid of experimental design, the client sought a modern remodel that would highlight terrazzo—a material she’s loved since childhood—and complement her minimalist lifestyle as well as the aesthetics of her loft. 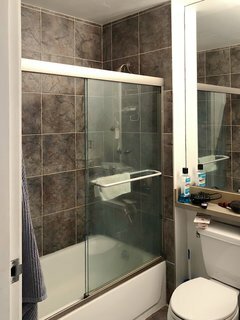 Before: The original, builder-grade materials made the 40-square-foot bathroom feel dark and small. Before: The bathroom shelving and storage setup often led to the build-up of clutter. "The design was truly a meeting of the minds between us and the client," says Lisa Backus and Andrea Richardson, the founders of Design Bar Detroit. 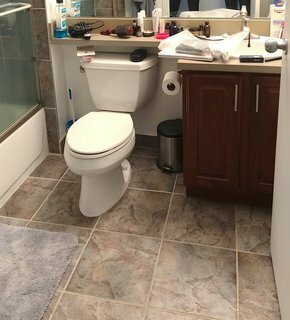 The floor tile is from Virginia Tile, while the wall tile is from Daltile. They continue, "It’s not everyday you get a client with such unique inspiration, and who is willing to get experimental! It was a fun challenge to pack that amount of creativity into a 40-square-foot space." 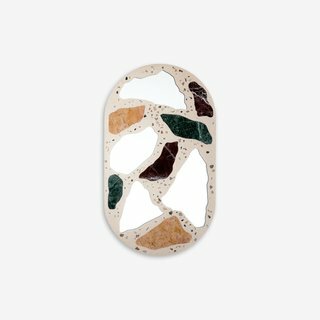 The #3000 Mirror, which was named for the grit required to polish its surface to a smooth plane, emulates the "hone terrazzo floors of Milanese lobbies and Venetian palazzos.” Created by the minimalist-focused architecture store Leibal, the mirror is cast in concrete and made with polychrome marble. 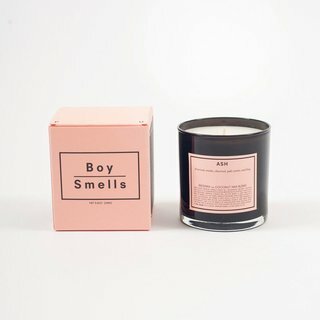 Hand poured in the Boy Smells Los Angeles Pico-Union studio, these beeswax and coconut oil candles are both beautiful and rich-burning. 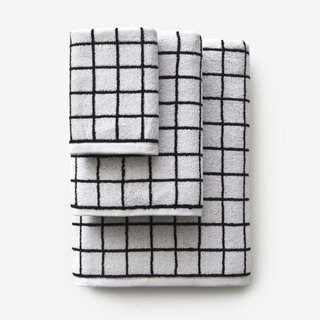 Get your bathroom squared away with Unison-designed Mini Grid Black + White Towels. Clean geometry and Portuguese-woven cotton will give your morning routine a fresh new look with white on one side and black on the other. The shower surround tile is I COCCI by Fioranese Ceramica sourced through Olympia Tile/Beaver Tile. 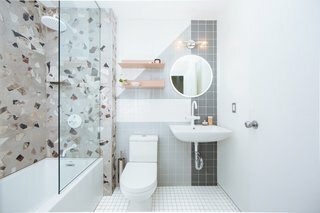 Completed for just over $17,000, the 40-square-foot master bathroom was stripped to its studs, and new materials and fixtures were inserted to create a "bright, highly custom, modernized master bathroom with increased lighting functionality." 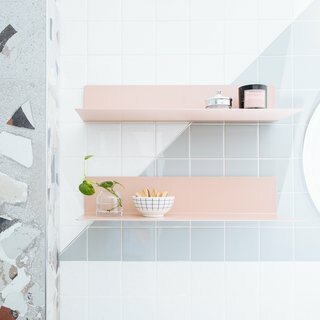 The blush pink shelves were sourced from Blu Dot. The plumbing fixtures are from Rubinet. 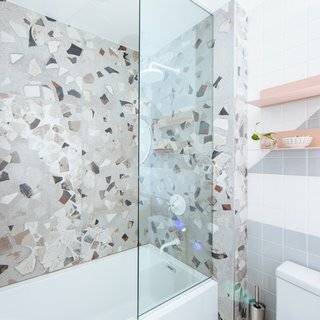 "One of our favorite features is the geometric tile accent wall that we created using classic, 4" x 4" tiles, some of which were cut on a 45-degree angle and finished off with a piece of chrome Schluter strip, resulting in a retro-meets-futuristic aesthetic," say Backus and Richardson. Storage space was relocated to encourage a more minimalist lifestyle. A deeper Jacuzzi soaking tub was installed. 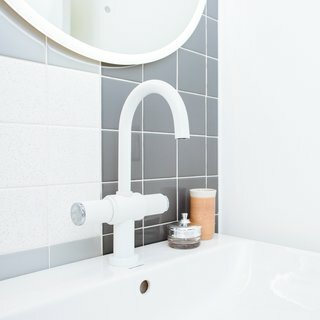 The sink is from Duravit. 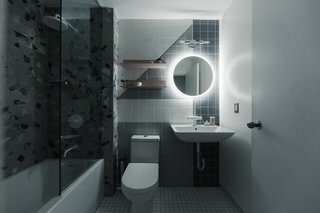 Recessed cans, a Miseno illuminated mirror, and accent Dutton Brown sconce are all switched separately to provide lighting flexibility.